LABORDE, Léon Emmanuel Simon Joseph de. Paris, Giard (colophon: printed by the Imprimerie Normale/Jules Didot l'ainé), 1830[-1834]. Royal 1mo (42 x 59.5 cm). With lithographic title-page (with a large lithographed title vignette separately printed on "India" paper and mounted on the title-page) and lithographed coat of arms of the dedicatee Wilhelm II of Hesse printed directly on dedication leaf, 69 lithographed plates (3 double-page and 1 larger folding) showing views, maps and plans after Laborde and Linant de Bellefonds, most separately printed on "India" paper and mounted on the leaves. With 1 zoological plate (of a marmot and young: "El Oueber") subtly coloured as published. Period-style half calf with gilt title to spine. First edition of "an important work" (Blackmer) of a stunning and beautifully illustrated account of some of the earliest explorations in the Sinai, southern Jordan and northwest Arabia, complete with all the magnificent views in extremely large format, the double-page plates measuring about 58.5 x 83 cm and the folding map of the Sinai about 74 x 102 cm. All subsequent editions, including the English one, were published in octavo and contained only a few plates based on the present first edition, all in drastically reduced format. The plates show maps, plans of ancient sites, views of ruins and other buildings, coastal and other topographic views, costume plates, hieroglyphic and other inscriptions, flora and fauna. 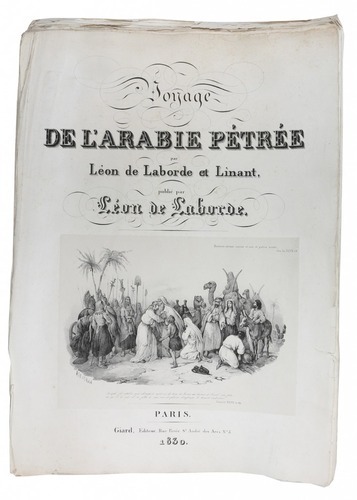 Laborde journeyed to the ancient city of Petra in what is now Jordan with the engineer Linant de Bellefonds in 1828, travelling from Suez via St. Catherine's and through Wadi al-Araba to Akabah. The topographic term Arabie Pétrée derives from Ptolemy's division of Arabia into three . The maps in the present book show it as the Sinai peninsula, the southern part of what is now Jordan and the northwestern part of the Arabian peninsula. The city of Petra itself is extensively documented in many of the present beautiful plates. Slight browning and foxing, occasional waterstaining and tears to folds; a small tear in the map repaired, but in all a good, wide-margined copy in loose sheets, apparently never bound. 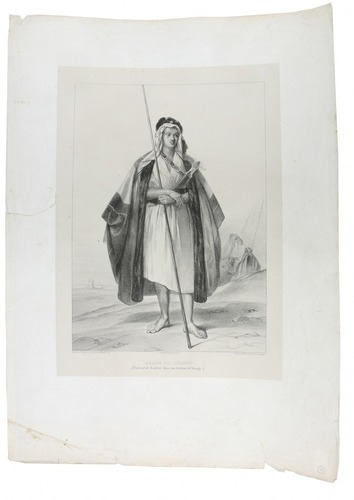 Rare: the last complete copy came up for auction in 2009 (Christie's, 3 June, lot 120: £23,750). Blackmer 929; Brunet III, col. 714; Gay, Bibl. de l'Afrique et l'Arabe 929; Henze III, 101; Vicaire IV, cols. 758-759; cf. Macro, Bibliography of the Arabian peninsula 1386 (2nd ed. ); not in Atabey.